A trip through some of the most breathtaking landscape in Norway. Includes Bergen Railway, Flåm Railway and a fjord safari with guide. This is a very popular round trip that lasts about nine hours and takes you through some of the most beautiful landscapes in Norway. The tour includes the Bergen Railway, Flåm Railway and a fjord safari with a local guide from Flåm to Gudvangen. The Basic Fjord Tour starts at the railway station in Bergen with the scenic railway journey from Bergen to Myrdal station. From Myrdal station, the tour continues on the famous Flåm Railway, one of the steepest standard gauge railway lines in the world. 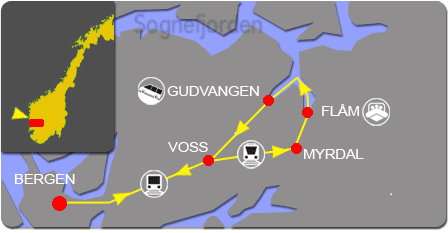 The Flåm Railway is very easy to find at Myrdal station. The 20-km-long train ride is a fantastic journey that offers panoramic views of some of the wildest and most magnificent mountain scenery Norway has to offer, including the famous Kjosfossen waterfall. The train ride lasts for roughly an hour. When you arrive down at Flåm, you have about 1 hour and 20 minutes to explore the village. Flåm is a charming small village surrounded by steep mountainsides, cascading waterfalls and narrow valleys. It is lovely just to stroll around, but you can also visit the Flåm Railway Museum. It is also a nice place to catch a bite to eat before embarking on the fjord safari. You then rendezvous at the quay at 11.55 to get dressed, equipped and register for the fjord safari. There are maximum 12 passengers and a guide in each RIB boat, so it almost feels like you are on a private tour. The boat stops at several places en route and the guide tells interesting stories about the local history of the fjords. You will also have a good chance of seeing some marine wildlife and birds in their natural element, for example seals, harbour porpoises and eagles. On this safari, the boat heads out the Aurlandfjord and up the Nærøyfjord. You arrive in Voss at about 14.25, from where the tour continues by train to Bergen This stretch takes about 1 hour and 20 minutes. The ticket is an open ticket that can be used on whatever train you want to take back to Bergen. The first train you can take departs at 14.37, arriving in Bergen at 15.56. The Basic Fjord Tour lasts about nine hours, and it takes you through some of the most beautiful scenery Norway has to offer.